Handsome Devil Originally uploaded by idoru45 For some reason, I really love this graphic. 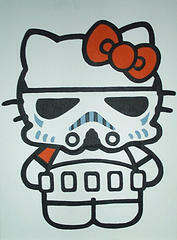 Hello Kitty + Stormtrooper = awesome. I don’t know why I like this song so much, but I do. I may even pick up the CD/DVD!